Christian Yelich was born on Thursday, December 5, 1991, in Thousand Oaks, California. Yelich was 21 years old when he broke into the big leagues on July 23, 2013, with the Miami Marlins. 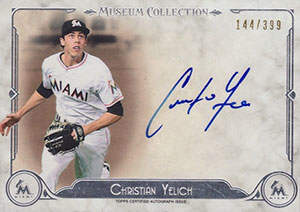 His biographical data, year-by-year hitting stats, fielding stats, pitching stats (where applicable), career totals, uniform numbers, salary data and miscellaneous items-of-interest are presented by Baseball Almanac on this comprehensive Christian Yelich baseball stats page. Christian Stephen Yelich is an active Major League Baseball player for the Miami Marlins (2013-2017) and Milwaukee Brewers (2018-today). In his second big league season, Yelich won a Gold Glove , the first Marlins outfielder to ever receive the honor ! On August 29, 2018, Christian Yelich hit for the cycle against the Cincinnati Reds , collecting six-hits in six at-bats . Nineteen days later, on September 17, Yeli hit for the cycle again , the fourth player in Major League history to collect two cycles in the same season , the first to record them both against the same opponent in the same season! Christian Yelich was the fourth Milwaukee Brewers player to go 6-for-6 in a game. The previous three joined this elite club in the listed seasons, see how many you can guess; 1973 ( Answer ), 1993 ( Answer ), 2013 ( Answer ). Christian Yelich homered on Opening Day in 2019, then continued to homer during the next three consecutive games. He was the sixth playing in Major League history to homer in his team's first four games, joining Willie Mays (1971), Mark McGwire (1998), Nelson Cruz (2011), Chris Davis (2013) and Trevor Story (2016).